Pebble Beach Golf Links - Pebble Beach, CA — PJKoenig Golf Photography PJKoenig Golf Photography - Golf Photos For Those Who Love The Game. 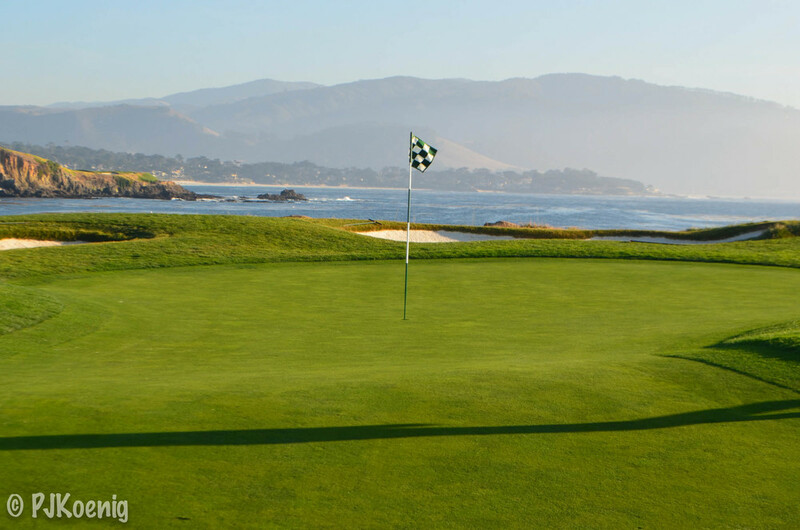 Pebble Beach sits atop the pjkoenig rankings as the #1 course in all of the land. The combination of scenery, history, challenge and playability make it almost impossible to beat. Holes 4-10 are simply stunning. No other course in the world keeps the foot on the gas pedal for 7 straight holes like Pebble Beach does. After ducking inland for a stretch on the back 9, it comes right back to hit you in the face with the oceanside 17th and 18th holes. 1919: Pebble Beach is released to the world. However, it wasn't until 2008 that the current 5th hole was introduced. Pebble Beach had to acquire the ocean front land connecting the 4th and 6th holes and Jack Nicklaus oversaw it's construction. 1935: Cam Puget pockets $300 in prize money for winning the California State Open. 1958: television cameras point towards Pebble Beach for the first time at the Bing Crosby National Pro Am. Bing hosts a live broadcast from the 18th green. Live scoring on the mobile app not yet available. 1961: Jack Nicklaus plays Pebble Beach for the first time, he would later go on to say that if he could only play one course for the rest of his life it would be Pebble Beach. 1972: Jack Nicklaus wins the 1st US Open at Pebble Beach. As of 2010, Pebble Beach has hosted the US Open 5 times. 1982: Tom Watson chips in on #17 to win the US Open. A plaque commemorating the shot exists on the exact spot today. 1986: The Crosby Clambake turns into today's AT&T Pebble Beach National Pro-Am. 2000: In the midst of ruling the golf world, Tiger Woods dominates the 100th US Open and beats everybody by 15 strokes. Thats 15 strokes. 2001: Pebble Beach becomes the only public golf course to ever attain the honor of #1 course in America by Golf Digest. 2010: PJKoenig plays Pebble Beach for the 1st time. Later on that year, Graeme McDowell would win the US Open. My golfing bud, Joe Garvey, is a solid 2 handicap with outstanding pants. Since Joe and I have January birthdays, we decided to spend a joint birthday celebration at Pebble Beach Golf Course. This would be Joe's first round at Pebble Beach and my 2nd. Joe was generally worked over throughout the day to the tune of a 91 and I added a uninspired 89. As much as we would have liked to blame the distracting views or high winds, we mustered no excuses. Afterwards, as we tipped our caddies, I looked at him and asked "Was that worth the $500?" he thought about it for a while and said, very seriously, "Yes." I agreed and we grabbed our clubs on the way to the parking lot. To Joe's credit, he made some outstanding birdies on #6, #8, and #14 as a part of that 91. Update: In November of 2015, gottaGolf hosted the Play Pebble with Paige contest featuring aspiring LPGA star, Paige Spiranac. I was lucky enough to take pictures. Head on over to the Golf Blog for the full story.